Provides property options to pass or set report parameters default values at run-time using the parameters property. You can set the report parameters while creating the Report Viewer control in a script or in the Web API Controller. 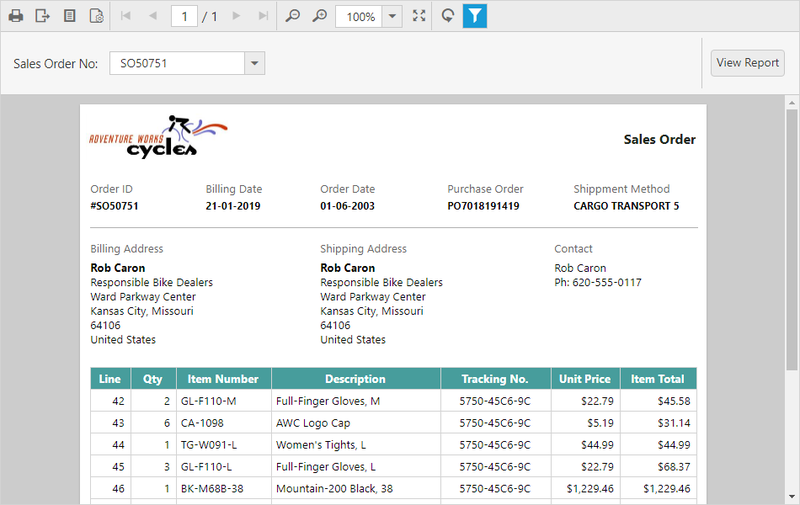 In this tutorial, the Sales Order Detail.rdl report is used, and it can be downloaded from here. The parameters property takes the JSON array value input with parameter details. 1.Set the default value data to the values property and name of the report parameter to the name property. The parameter name is case sensitive, it should be same as available in the report definition. 2.The following code example illustrates how to set report parameter in the script. 3.Run the application and the result shown as in the following screenshot. To set parameter default value in Web API Controller, use the following code in the OnReportLoaded method. The ReportHelper class provides methods that help you to get the report parameters used in the report. The following helper methods used to get parameter with or without values. GetParameters Returns the parameters that are used in the current report without the processed values. GetParametersWithValues Returns the report parameters with processed data values that are used in the current report. You can use the following code sample to get parameter names and set parameter default values.